Years ago, an ancient Phoenician statue known as the Navigatorwas stolen from the Baghdad Museum, and there are men who would do anything to get their hands on it. Their first victim is a crooked antiquities dealer, murdered in cold blood. Their second very nearly is a UN investigator who, were it not for the timely assistance of Austin and Zavala, would now be at the bottom of a watery grave. What’s so special about this statue? Austin wonders. The search for answers will take the NUMA team on an astonishing odyssey through time and space, one that encompasses no less than the lost treasures of King Solomon, a mysterious packet of documents personally encoded by Thomas Jefferson, and a top secret scientific project that could change the world forever. And that’s before the surprises really begin . 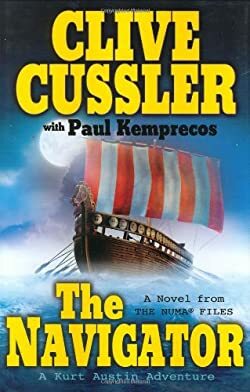 . .
Rich with all the hair-raising action and endless invention that have become Cussler’s hallmarks, The Navigator is Clive’s best yet.